SEO in 2015 – What Has Changed and By How Much? There is always a lot of talk about how SEO is changing all the time and to a degree this is true. It is however more about the change in quantity of each part of the ‘SEO Recipe’ than the addition of new factors. However saying that, new factors do arise and in 2015 three have been added to the list of factors that affect the rankings of a site, these being ‘Vertical Search’, ‘Direct Answers’ and ‘HTTPS’. The changes in the recipe are reflected by ‘movements, both positive and negative’ in the amount that each item is likely to affect any rankings. There is no doubt some truth to much of this, but the fact of the matter is that Google only uses any of its own rules as a guide to how it will rate a site, and often seems to list sites that, based on the rules that we know simply do not deserve that high page ranking. It must also be said that the experiments / research that have led to the publication of the data and table below cannot be said to be totally scientific, for the simple reason that there are too many variables influencing the rankings gained. However, saying all this, the data is useful and for my part seems to be following the path / trend of Semantic SEO. The first indication that this is the case comes in the very first part of the SEO Periodic Table, the ‘Cq’ (for Quality of the Content’) being give an +3 factor, the ‘symbol’ below, for Research into the Keywords that you want to rank for, also being given a +3. The latter I feel really relates to the fact that this research leads on to the inclusion of the ‘right’ words on a page, words that are relevant to the search term targeted AND ones that Google ‘expects to see’. The latter point is an interesting by the way, as it is all about the ‘Reverse Engineering’ of web pages. The process is simple enough. You decide upon the target phrase, then discover the top sites on Google for that phrase and what words are found on the majority. It stands to reason then, that using the same words (as far as is possible and looks right) on a page on a site will increase the possibility of that page being ranked for the target phrase. This is all music to the copy writers ears, as now, besides the target words, they are also provided with a list of words to use as well as an indication to which are the most important. However, to get back to the SEO table, we can see the words on the pages actually has its own symbol, the with a +2. Other factors are ‘old’ ones, but with their ‘power’ updated to take into account how much they appear to affect rankings today in 2015. One that is especially interesting is the ‘Hd’ symbol (for Meta Description). This is indeed a factor that has been around for many years now, but today, it has another way of altering the rankings of its page. This change stems from the ‘SEO Feedback Loop’ that Google is now suspected of running. Here the CTR (Click Through Rate) % of all the links on a Google SERPS result are checked, the idea being that if a page is listed but only gets a low CTR there must be something wrong with the way it is listed and this of course is the owners fault. The owner can of course monitor low CTR by checking on Webmaster Tools (Now Google Search Console) and then make some changes (to the Meta Description) in order to boost the CTR. However, if they don’t and the pages CTR continues to be low, the page may lose it’s SERP’s listing (or at least be demoted), thus the need to make sure it is right becomes obvious and why the power of the Meta Description has been increased. Another change is that of the symbol ‘Am’ for mobile. This has increased by 2 points as well, and of course refers to the need for all sites to be Mobile Friendly. On the other hand, we have those factors that have a Negative effect on rankings, all the old favourites like ‘paid links’ (Vp) , Keyword Stuffing (Vs) and Spammy links (VI) being present. As I say, it is the quantity of each component of recipe that changes, not the (for the most part at least) the actual components. The article (and table) is a good read though and I’d recommend it, and thank the hardworking staff at SearchEngineLand for it too. https://www.serendipity-online-marketing.co.uk/wp-content/uploads/2015/03/SMO_logo-300x138.png 0 0 graham https://www.serendipity-online-marketing.co.uk/wp-content/uploads/2015/03/SMO_logo-300x138.png graham2015-06-23 10:46:062019-02-28 13:13:53SEO in 2015 - What Has Changed and By How Much? Having a fabulous website is one thing, getting visitors to it is quite another. The problem is, that there is millions of other fabulous websites on the internet so yours could easily get lost in the throng. So, how can you get visitors to your site and get it on the search engine rankings? Well, many roads lead to Rome and most people use SEO and or PPC to publicise their sites. The saying that ‘content is king’ holds very true so do not skimp on your content. It needn’t be pages and pages of commentary, it is the quality of what you have written that counts. A shorter well written piece is worth more than thousands of meaningless words, so consider your content carefully. Don’t get too hung up on SEO, in the past, all you had to do was make sure you had the right keywords all over your content. Nowadays, that is likely to get you a penalty, so, yes, you can still use keywords but you need to use them cautiously and they must be used in context. Long tail keywords are particularly useful, more so if you are trying to attract a local audience as you can include place names in these. Using keywords in such a way that they are part of the answers to searchers queries will help your cause. These days it really is vital to consider who is going to be visiting your site. You need to know what your target audience is looking for and make sure that your content reflects this. There is no point in attracting people who are not interested in your site, they won’t hang around and the search engines do notice this. The search engines are geared to matching content to appropriate searches and this is why you need to know exactly who you want to visit your website. Never ever pass off someone else’s writing as your own, this is plagiarism and is in effect, theft. Create your own content, written in your own words or you might find that your site rankings take a severe downwards plunge or worse, your site could be de-indexed which means it will not be found via search engines. Duplicate content is another no-no, make sure that none of the pages of your site have duplicate content within them, each page should have totally unique content. You can use curated text however, there are rules regarding its use and these must be adhered to. Don’t ignore social media, it is not valuable on its own, but as part of an overall SEO strategy, it does have its place and could make the difference between a prominent listing and getting lost in the crowd. It does require a bit of work to nurture it but this is well worth the effort. Creating a search engine optimisation (SEO) strategy is hardly a new challenge for businesses, but many still get the basics wrong at disastrous cost in this digital age. At the same time SEO demands continue to evolve. Google, for example, recently followed ned user behaviour and changed its search algorithms to favour mobile-friendly sites in its rankings. Many businesses still conduct SEO without considering mobile traffic as a key component within their strategy. On average, over 40 percent of online visitors browse destination websites through a mobile device during their online journey. With Google releasing mobile specific algorithms to track and monitor mobile specific website performance, businesses need to start thinking about mobile users just as much as traditional desktop users alike. Many businesses naturally develop their website structure over time without any real strategy or SEO logic. After years of adding categories, information pages and product lines, the result is an uneven, bloated site structure that gives little value to key categories and landing pages and stops users from migrating easily around the website. Getting a site -wide audit helps to overcome this natural mistake, which mroe than 80 percent of businesses make as they develop into seasoned online retailers. So many SEO stakeholders still set poor objectives for SEO based on simplistic metrics such as Rankings. A good SEO campaign will be broken down into quarterly segments, with objectives set each quarter depending on the maturity of the campaign. Sites are migrated onto new domains, or re-launched on a new platform (with new URLs), and the relevant notifications and redirects are not carried out. When URL locations change, 301 redirects need to be put in place to ensure users continue to arrive at desired destinations within the website. When a site is migrated to a new domain, Google should be notified using the “change of address” tool within Google Search Console, so that they can update their indexes. Many internal dev teams spend thousands of man hours developing cutting edge functionality for destination sites but unfortunately forget to integrate the Search Console tag. Without this, SEO-critical updates cannot be carried out and Google cannot notify webmasters of issues with sites. Updating a website sitemap has many benefits. Not only does it provide easier navigation as well as better visibility by search engines when they come to index the site but it also offers the opportunity to inform search engines about any changes on site. Having a dynamic sitemap means it will update itself and also notifies search engines when a page has been added. Should webmasters choose to ignore adding a sitemap, it will take search engines much longer to crawl and index the site which is bad news if you make regular updates. Moving a website will happen from time to time as a business evolves. Always consider the SEO impact of this move, including 301 redirects, database migration and the impact on the user journey. Putting together a migration plan at the earliest possible stage allows for all stakeholders to be aware of the work needed by each party and the timescales associated with this work. Getting a migration wrong can have an ongoing impact on traffic, rankings and overall conversions. Such news items are however also a great time to do a spot of ‘Newsjacking’ where with a bit of creative thought, you can ride the wave a little and promote a relevant business or product. So, when I listened to the news and found out, to my surprise that all athletes had to register where they would be an hour an hour a day for the next three months, AND BE SURE TO BE THERE, just in case an unannounced dope test was scheduled for then, I thought, WOW, this is just where one of the clients of SOM could really, really help out. The client in question is FastSMS, the service they provide being SMS messaging. You will no doubt have received text messages from your Doctor, the dentist, your garage, etc reminding you of a future appointment (and if has not happened it soon will, as long as you have a mobile phone that is). Thus, when I heard that these poor athletes have to remember to be somewhere (up to three months in advance) I thought, is not this a great application for SMS Text messaging? All you would need to do is to have a mobile phone number associated with an Athletes entry into the ‘Where I will be’ Dope Testing system and a little bit of ‘programming magic’ that sends them a text the day before saying where they ‘have to be’ tomorrow, with another 2 hrs before. JOB DONE, I reckon, no excuses and less hassle for all. I have had a word with FastSMS and they are looking into this right now, and will soon have a post up on their blog, they are even considering offering this service to the dope testing people at UKAD. This is a good example of ‘NewsJacking’, in a positive manner and should be born in mind by just about any business there is…. Mo Farah put his hopes of competing at London 2012 at risk by allegedly missing two drugs tests in the buildup to the Games and was warned by his coach Alberto Salazar that “they will hang you if you miss another”. Under World-Anti Doping rules, a third missed test within the space of 12 months is the equivalent of a failed drugs test – and so would have left Farah, who went on to take 5,000m and 10,000m gold in London, facing a minimum of a two-year ban. According to the Daily Mail, which has seen an email exchange between the UK Anti-Doping Agency and Farah’s representatives, Farah missed one test in 2010 and another in early 2011 shortly after he had joined Salazar’s training group in Oregon..
Link building comes in many guises and today is increasingly to do with getting Social Signals (Tweets, Likes, Shares etc) as well as conventional HTTP style links from one site to another. As we have discussed, the ‘power’ of links (for SEO Purposes, traffic is a different ball game entirely) is dropping, Google trying to move away from using links as a guide to what is best because the whole area has been ‘gamed’ by SEO companies trying to inflate the importance of a site beyond the level which it really deserves. Just the like a barrister is a the judicial system, it is not my job (or any other SEO company’s for that matter) to ‘judge’ (what site should be Number 1), we simply have to do the best for our clients. More Content Required if Rankings Wanted! The fact is that we do often tell them that they have to do a lot of work on their site (better content) to get better rankings, this needed as well as the links and the creation of ‘signposts’ on their site to help Google understand what the site is all about. and is well worth the read.. So, your link building campaign didn’t perform as expected — now what? Columnist Casie Gillette weighs in on how we can learn from our mistakes. You spent weeks crafting the perfect link building campaign. The content idea you came up with was researched, drafted, and re-drafted — and the final piece was fantastic! People were identified for outreach, emails were sent, tweets were tweeted, and then… crickets. The piece didn’t get nearly as many shares as you’d hoped; it garnered no links; and many of the people you reached out to didn’t even respond. What gives? Did something go wrong? Is it possible the campaign wasn’t as awesome as you thought it was? Unfortunately, as with most marketing initiatives, not every campaign is going to be a massive hit. The key to future success, however, is being able to push aside your frustration, take a step back, and figure out what to do next. After all, you don’t want all of that time and effort to go to waste. First and foremost, reevaluate your promotion strategy. So often, a content promotion/link building strategy simply entails finding people we think should be interested in our content and then telling them about our content. No. Part of creating a successful promotion strategy, especially when it involves outreach to those you don’t know, is identifying people early and interacting with them before your content goes live. That way, when your content is ready to go, you aren’t a stranger spamming them — you’re someone they know and (hopefully) like. In addition to connecting with people beforehand, it’s important to make sure you’re connecting with them the right way. At an event several years ago, a speaker noted that if you wanted to reach him, you should connect with him in a place that’s less crowded. His email was constantly being barraged, and his Twitter feed was hard to keep up with. What he suggested instead was reaching out to him through Google+ or LinkedIn. These were places where he was more likely to get the message and more likely to respond. Tip: Connect with people where they are active but where there is less noise. We’re all busy. Between work, family, and life in general, there just isn’t a lot of extra time in the day — and there certainly isn’t a lot of time in the day to help a random person promote their content. When evaluating your content strategy, take a look at when you did your outreach. Did you send an email on a Monday morning? Did you look to see if the person was traveling or on vacation? Before you actually send that email or push out that tweet, do some research on the person to find out if they are even in the office. Take a look back at previous messages or previous social updates to see when they are most active and/or most likely to respond. Tip: By identifying the most optimal time, you increase the odds of your message being seen and acted upon. When reevaluating your outreach, take a look at the messaging itself. Did you actually communicate the reason your recipient would be interested in your work, or did you simply tell them you had a piece of content you thought they’d be interested in? If it’s the latter, there’s a good reason they didn’t help you. Tip: The outreach message shouldn’t be about you and your content. It must help the person in some way. There are some great free tools out there (e.g., Rapportive, Sidekick, Yesware) that will tell you if and when an email was opened. Take a look and see if your emails were even opened. Perhaps they went to spam, or perhaps they were opened once and forgotten about. In that case, think about what you can do in the future. As you reevaluate, if you decide you just aren’t ready to throw in the towel on the content you worked so hard to create, consider doing a quick paid promotion. A small budget could help your piece gain some traction. Don’t believe me? Check out this piece from Larry Kim — $50 could mean major press. Don’t let your great piece of content go to waste! Seriously. After spending all that time and effort, make sure you get the most out of your content. Whether you turn it into an infographic, a Slideshare, or a blog series, make sure you don’t just set it and forget it. Tip: Neil Patel has a really useful guide on the various ways you can repurpose content, and it’s well worth the read. On the other hand, if your promotion plan was spot on and you can’t figure out a way to repurpose your content, perhaps the content wasn’t quite as great as you thought. At my last job, we came up with an awesome contest that would drive links, build brand awareness, and get people talking about us. Except that it didn’t. While I still stand by the fact the contest idea was awesome, our execution wasn’t done as well as it needed to be. On top of that, the timing was way off. The problem is, after you’ve gotten buy-in from execs and the money to execute a campaign, failure can be really hard to swallow. It can also make it really hard to get buy-in and budget the next time around. Refocus your efforts on some of the smaller things that can help drive results. As long as performance continues to improve, you’ll likely be able to try a bigger campaign down the road. As I mentioned at the beginning of the post, all campaigns are not going to be a hit; unfortunately, even when links seem warranted, you may not get many. As I heard at SMX Advanced last week, links are harder to come by these days. I have been working in the area of Search Engine Optimisation for 14 years now and have seen a lot of changes (and also a lot of misinformation published) so it was with a lot of JOY that I found this blog and its attached Infographic. The whole thing is 100% sense and accurate in my view, in fact I could have (should have?) written it myself. In the full article (only a piece of it included below to keep to the ‘etiquette’ of the web, so you’ll need to go there to see the Infographic) you can see how each of 10 Myths are shown to be just that, myths. Besides covering the fact that SEO is not Dead (love that one, keeps coming up), it also tells how ‘proper’ SEO is not a bag of tricks but a clever strategic plan that gets a site’s content the exposure it deserves. The latter phrase is very important though, as now, with Google getting smarter and smarter by the minute (to some degree this smartness is being provided by its users – see my blog on the SEO feedback loop – it’s not all computer power) a site will soon only get really good rankings and traffic if it ie really good (sounds fair to me). The fact the now Google is ‘demanding’ longer pieces of work is also covered, as well as how Guest Blogging is still a good way of delivering ‘power’ to a site (but only if the site too has great content – remember that bit, it’s important). Another great myth that is covered is that Google ‘hates SEO’, it does not and in fact needs site’s to co-operate with it and lay things out in a certain way, which after all is a part of SEO. A great SEO Article and Infographic, do read the curated bit below and then visit the source for the rest and the great Infographic. If you’ve done any research regarding SEO online, then you’ve probably noticed that in addition to all the tips and tricks everyone claims to know, there are a lot of contradicting statements about the use of SEO as well. This is because there are a lot of SEO myths floating around, myths that you shouldn’t fall for, myths that makes us cringe every time we come across articles like that. 1. SEO is Dead! Again! This cry of anguish echoes across the web every time that Google releases a new algorithm. It happened when Google released, Panda, Penguin, Florida and Hummingbird Mobilegeddon and it will continue to happen. And guess what? It’s never true. Here’s the thing – SEO is never going to just be rendered obsolete by one of Google’s algorithms. Instead, it will just become more complicated and, at sometimes, more frustrating. For example, in the early stages of SEO, keywords were all that mattered. As long as you put as many keywords as possible into your content, your page ranking would increase. Obviously, Google didn’t like this as it diminished the quality of their search results pages. So they changed the algorithm. Now Google puts as much emphasis on social activities, high-quality content and content marketing that it does on keywords. This made sense for Google to do since more and more content is being posted on the Internet every day, which means competition is getting stronger. In fact, it’s because of the competition that SEO will still play a vital part in online marketing and why there continues to be a growing demand for SEO agencies. When it comes down to the bottom line, SEO isn’t going anywhere because Google needs these signals in order to accurately determine the quality of content. • Creating helpful and informative content that meets the needs of users. • Making content easier to find for both users and search engines. • Improving accessibility through the user experience and the website architecture. • Optimizing your content for social sharing standards. • Improving technical standards in order to assist search engines in categorizing and serving content to the proper audience. • Increasing exposure as well as web traffic through links and mentions. Tricks have nothing to do with real SEO. Real SEO takes effort and requires quality in order to be effective. • Link degradation – A good website has links to different websites and vice versa. However, if any pages stop working or a website disappears, your links won’t work anymore. This is called link degradation, or link rot. You need to check your links on a regular basis to avoid link degradation. • Publishing new content – You are going to lose web traffic as well as interest in your brand if you don’t publish new content on a regular basis. New content will attract more visitors, who will then be able to share that content on social channels, causing a domino effect that could result in more leads. • Evolving search engine algorithms – You’ve got to keep up with new algorithms as they can change how your website is ranked. • Competition – If you don’t keep your content up to date and release new content regularly, your audience will end up finding its way over to competing websites that do keep their website up to date. • Outdated content – If you no longer carry a product or offer a service, you need to make sure this is reflected on your website’s content or else you’re going to annoy and confuse potential customers. The meta tag includes the title tag, meta description and keywords of a page. Many experts believed meta tags went the way of the dinosaur after the Hummingbird update. Sure, Google doesn’t use them as a factor in its page rankings anymore. However, they are still important as they not only tell search engines what your site is about, they tell users what your site is about. The length of your content actually does have a big impact on your SEO. If you look at the average length of the content on web pages ranking in the top 10 results for any keyword on Google, you’ll see that it’s at least 2,000 words. In fact, the higher up you look on the search listings page, the more content each web page has. One of the reasons is that longer content is more in-depth than shorter content – and people are much more likely to link to an in-depth piece of content. Length matters, and longer content performs better. Anyone who says that social activity has no bearing on SEO must be living under a rock. Google takes into account the social signals of your content when determining its page ranking. Content that is shared, liked or commented on will be rewarded with higher page rankings. This is because Google takes social activity as a sign of quality. There was a big uproar in 2014 when Matt Cutts announced that guest blogging no longer worked. Except that this isn’t what he said. He said that you shouldn’t use guest blogging as a way to get links. What people were misunderstanding was that he was warning against publishing poor content on other blogs as a means of improving your link building campaign. Guest blogging is no different than regular blogging – you’re posting content online. Matt Cutts later took back what he said about guest posting and apologized. Google doesn’t hate SEO at all – in fact, it depends on it to help better match high quality content to user search intent. What it doesn’t like is websites that attempt to take advantage of SEO in order to artificially boost their page rankings since this hurts the quality of Google’s search results. Embrace SEO as a way to create a high quality website and to improve your reach, not as a way to just get more traffic. You’ve heard it so many times – “Content Is King.” It’s true to an extent, great content is the foundation of a successful online marketing campaign. However, just because you produce amazing content doesn’t mean that readers will start magically appearing to promote your content and brand for you. SEO is necessary in order to get your content the exposure it needs to have an impact. These are 10 all-too-common SEO myths that you should make sure you don’t fall for! Google Adwords can be a really effective way of bringing in traffic to any site, but it does not always work as well as you might like? Of course the main thing you have to do is to carefully monitor your Adwords account, making sure that you are actually bidding on the right terms (the ones that convert and don’t have a high bounce rate) and are using the right matching system and the right negative keywords. The part about choosing the right keywords is obvious, but there is a lot more to it than that (which the article covers in depth). It should always be born in mind that you can end up spending too much on Adwords if you are not careful, so if you feel out of your depth here, do seek advice. Google are helpful themselves of course, but as they have a vested interest I’d suggest that you contact an Adwords Expert for help. For some lucky businesses, there are a wide variety of great, relevant, frequently-searched-for terms that they can easily marry to engaging content assets and drive lots of great traffic. If a business is fortunate, there are more great ideas for profitable terms than there are resources to create related content. That may not be the case for your business, though. Some businesses have a relatively limited universe of keywords they can target through organic and paid search, and when they finally find a great term that drives significant traffic and actual leads and sales, they want to expend whatever resources they can on getting more of that traffic. But what if you’re already ranking number one? Or what if a term that you know works very well in your AdWords account just isn’t something you can seem to squeeze any traffic out of in organic search listings? What if a few super authoritative sites (maybe even Google itself) are outranking you and the SERP is shrinking, for instance? My company does a lot of work with B2B SaaS companies, and we’ve found that enterprise-oriented solutions frequently have this challenge, as only a finite number of folks are actual prospects (and so a fairly limited set of terms can actually drive qualified leads). In this post, I’ll walk through several ways that you can leverage your knowledge about a specific profitable traffic-driving keyword to generate more of the same kind of traffic. This will allow you to capture more leads and sales without simply bidding more for your target term or banging your head up against the wall trying to rank better for a search term even though you’re actually “dead on arrival” to the SERP in the first place. There are a variety of ways you can use pay-per-click to capture more of the good traffic you’re getting from a specific term. To help demonstrate each of the different options for digging deeper on a profitable keyword in this post, let’s imagine we sell very expensive, complex point of sale systems specifically to food services companies. Because our systems are specifically designed for these folks, a lot of different terms we’ve tried have driven irrelevant leads, but the term “food service point of sale systems” drives lots of traffic for us, converts well, and drives lots of profitable leads. Let’s go and get more of that traffic. Ad Copy Testing — This is a pretty simple concept, but one many advertisers seem to overlook: If we get more clicks on our ad, we’ll get more of this traffic. An important bonus here is that an increased click-through rate will help us to improve our quality score, which in turn will make the cost of each of these clicks cheaper. That might mean we can bid even more aggressively and get even more of this traffic. Landing Page Optimization — Similarly, if we can get more of the people who are coming to our site to actually convert, we get more of these searchers to turn into leads. This would mean we could bid more aggressively for our keyword without blowing out the cost-efficient cost per acquisition that we’re enjoying. These may seem like fairly obvious options out of the gate, but when was the last time you created a new ad copy test or landing page variation for your core keyword? Do you have a system in place for cycling through new variations that may generate more clicks and higher conversions? If not, it’s something worth adding to your list. The second tip for getting more out of a keyword that’s driving profitable traffic is a simple AdWords setting that I find not many people are aware of: It’s called display select keywords. Basically, with display select keywords, you can create a display audience in much the same way you would with remarketing. But, rather than targeting an ad specifically to people who have come to your site, you can target your ad specifically to folks who have searched for a certain keyword on Google, even if they’ve never interacted with your site. Unfortunately the options to split this traffic out within AdWords aren’t great yet (it may eventually be updated), so you want to be sure that your standard ad copy works, and, if you incorporate image ads into the campaign, you want to make sure those work as well. I think of RLSA or “remarketing lists for search ads” as the inverse of display select keywords (and like display select keywords, it’s a feature I find not many people know about). What it allows you to do is set a unique bid for the folks who have visited your site previously when your ad shows for a specific term. You can create a new, mirror campaign and ad group targeting just the folks who have visited your site and are searching for your target term. One of the most successful marketing strategies that helped my former employer WordStream drive leads and sales was to pair content creation with remarketing campaigns. My old boss outlined how the company did it, step-by-step, in this detailed blog post. You can use remarketing as a holistic marketing strategy, but you can also use it to simply make the targeted keyword traffic you’re driving from profitable terms work harder for you. I can create a custom remarketing list just for traffic to those pages that hasn’t converted (by including people who visited those pages, and excluding people who viewed my thank you page). Then I can show those folks very specific ads for very specific offers (e.g., a “How to Evaluate Food Service Point of Sale Systems” download or “X Mistakes Companies Make Evaluating Food Service POS Systems & How to Avoid Them,” or just the offer that I already know is converting). Don’t forget about Bing! While the search traffic here won’t be as dramatic as what you’ll drive through AdWords, you might be able to capture incremental traffic at a significantly reduced cost-per-click and cost-per-conversion. SEO is not something that can be achieved instantly, it requires time, patience and effort. So, whether your business is brick and mortar or purely online, SEO can help you reach the target audience that are looking for your goods or services. There are so many different tactics that can be used to promote your business and it is always a good idea to make use of several as a multi-pronged strategy. Keyword research is first and foremost on the list of things to do. It really is essential that you perform a thorough keyword research so that you can target those words and phrases that are being searched for in your niche. These days, social media is an important aspect of SEO and you neglect it at your peril. You need to look at your business and find out where your customers/preferred audience hang out and make use of that platform. There is absolutely no point in using Facebook if most of your audience uses Twitter, so do spend some time investigating this so that you can harness its power. Link building is still as relevant now as it ever was however, these days you do need to ensure that any sites you link to have an equal or higher standing to your own in the eyes of the search engines. Poor quality, irrelevant or spammy links will get you delisted fast than you can say search engine optimisation! So, choose where and who you link to very carefully. When creating content, whether for your website or for your blog, do make sure that it is well written with correct grammar and punctuation. Do not use text speak, unless of course your target audience is teenagers! Make sure that spelling is correct, it doesn’t take long to run your piece through a spell checker. Content should be interesting and engaging so that readers want more, this will encourage them to return time and time again – and this is another important piece of information that should not be ignored as the search engines take note of this. There is no magic formula, if there was, everyone would be doing the same thing. It is a case of trial and error but ensuring that you remain within the guidelines. Any breeches of the rules will result in swift punishment from the search engines which your site may not ever recover from. Use only the methods recommended by search engines and by SEO experts so that you can get your site into a great position in the organic listings. A lot of these tips are still valid, but I have added a few new ones and updated it to reflect the new ranking factors of social media and mobile usage. So here are my 10 search engine optimization (SEO) tips for blogs – updated for 2015. Optimizing a blog is very similar to optimizing a website, and optimizing a blog post similar to optimizing a web page. But depending on the blogging service or software you use, the results may look somewhat different. If you follow some simple rules for search engine optimization, your blog will rank much higher than static website pages in the search engine results pages. Here are 10 of my favourite tips to get your blog posts ranked for the keywords of your choice. This is still one of the most important ranking factors. Whether you purchase a separate domain (recommended) for your blog, or host it on a blogging service or a subdomain of your own site, try to ensure that your URL contains the primary keyword you want to optimize for. For example, if you want your blog to get found for the keyword “seo” get a domain with the keyword “seo”, or use the keyword in a subdomain as in http://www.yoursite.com/seo/. Getting a domain name with your own name might make sense for personal branding, especially if yours is a personal blog. But if you’re blogging for business reasons and want targeted traffic to flow your way, primary keywords in your domain or subdomain are a move in the right direction. If your primary key phrase is “blog seo” make sure that the word blog, or seo, or both, appear in your blog headers (the H1 or H2 tags) as well as the title of each of your posts. Most blogging software will take the keywords in your post title and put them into the file name of the permalink it creates. 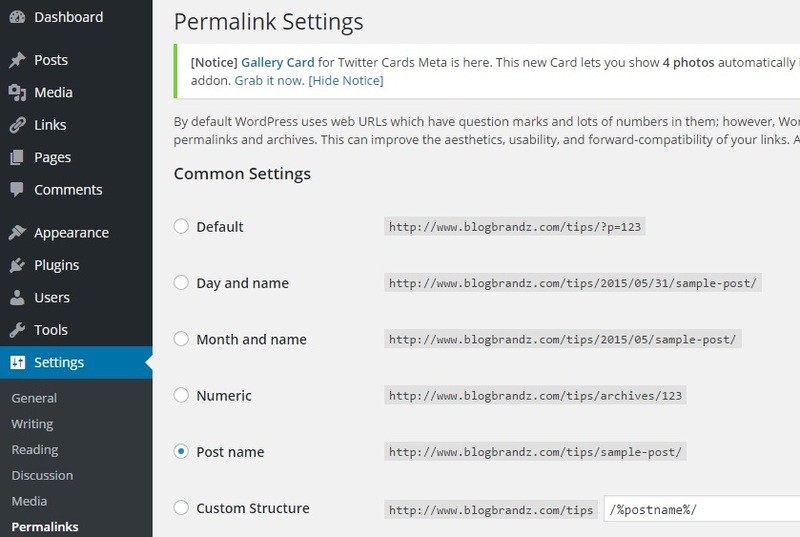 In WordPress, it is possible to achieve the same results by selecting the “Post Name” option in the Permalinks settings as I’ve done for this blog here. If you want to get listed for long-tail keywords use them infrequently in the body of your post and pepper your blog titles or links with them as appropriate. Don’t overdo this or your posts will end up sounding unnatural and spammy to readers. Write your blog post for your readers first and then add keywords in suitable places. If your post is unreadable because of keyword spam, it will not be of interest to either readers or search engines. With Google’s recent “Mobilegeddon” update, you must ensure that your blog is easily accessible and readable on all mobile devices. The best way to do this is by using a responsive theme that adapts your blog design to the device it is being viewed on. WordPress has thousands of free, responsive themes available that you can download and install right now. There’s really no excuse not to make this change when a growing percentage of internet users now access the web from their mobile or tablet. Set up your blog so that the side navigation bar is present on all pages. Make sure your archives and previous posts are accessible from all pages of your blog so they get spidered easily. You can take steps to ensure that all your pages get spidered by creating a Google Sitemap that lists all the pages and posts of your blog. WordPress has free plugins that can easily do this, but make sure that your Google sitemap is accessible from every page of your blog.